After signing the peace treaty, Imam Hassan (PBUH) returned to Medina, the city of his grandfather Prophet Muhammad (PBUH) and in the heavenly presence of the Prophet (PBUH) and the Prophet’s mosque, in about ten years took very fundamental steps. Ibn Abi’l-Hadid writes: “Because Muawiyah wanted to get an oath of allegiance for his son Yazid, he attempted to poison Imam Hassan (PBUH), as he did not see a greater and stronger obstacle than Imam Hasan (PBUH) towards gathering allegiance for his son and making his government inheritable; so he conspired and poisoned the Imam, causing his death”. In this conspiracy, Marwān ibn Ḥakam who was the governor of Medina played a major role. 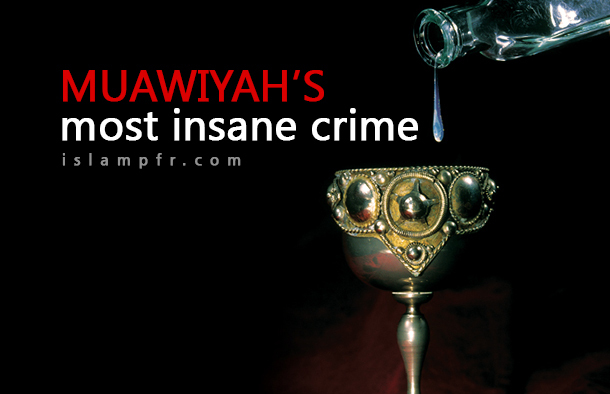 When Muawiyah decided to commit this horrific crime on the final occasion, he asked his governor Marwan in a letter to speed up the poisoning of Imam Hassan ibn Ali (PBUH) and to make it his priority. To carry out this conspiracy, Marwān was assigned the task of contacting Ja’da, the daughter of Ash’ath, who was the wife of Imam Hassan (PBUH). Muawiyah had in the letter noted that Ja’da was an unhappy and unsatisfied element and her mentality could facilitate her cooperation and he had also ordered to promise Ja’da that upon completing her mission, he would take her as his son Yazid’s bride. He had also suggested that they should pay her a hundred thousand dirhams. The reason for the death and departure of Imam Hassan (PBUH) was that Muawiyah poisoned him seventy times; however, it did not leave an immediate and lasting effect until he sent a venom to poison him to Ja’da, daughter of Muhammad bin Ash’ath bin Qais Kendy, and along with that venom, he sent twenty thousand dinars and made ten gardens from the gardens of Kufa in her name, as well as that he promised that after accomplishing the mission, he would marry her to his son Yazid bin Muawiyah. So, she in a special opportunity fed that venom to Hassan bin Ali (PBUH) and poisoned him. Ja’da daughter of Muhammad bin Ash’ath bin Qais was from a very base, inferior and opportunist family. She had developed a complex towards Imam Hassan (PBUH), perhaps due to not being able to have a child from him; hence when the venom from Marwān arrived and she heard the promises and saw the money, she accepted committing that great crime, and in a hot and sizzling day when Imam Hassan (PBUH) was fasting, during the breaking of his fast she poured the poison in the milk bowl and fed it to the Imam. The poison immediately tore his bowels and the Imam was writhing in pain and was saying: We are from God and we shall return to him. The last days of the Imam (PBUH), Jnadeh bin Umayya came to visit him. He says: The Imam (PBUH) was in an upset state and he was crying from the pain, a large bowl was put in front of the Imam (PBUH). Every once in a while, blood clots would come out of his mouth, it was here that I started to panic and became heavily saddened.